The Twin Mountain Slopes was a brief local ski area that operated near the present day Carroll Motel in Twin Mountain from before 1938 until likely World War II. It had a 350 foot long rope tow and an open slope. A skating rink was available nearby. Eddie Monahan remembers the ski tow (rope tow) and said Larry Fahey, Sr. owned the car which Lenny Burroughs and Johnny Houghton fashioned into a rope tow. They put the car at the top of the hill (above the house at the present day Carroll Motel). They ran the rope through the rim of the car with the car motor running. There was no charge to use the tow. Originally, it was operated for the townspeople. There was one trail. I never skied there but my husband, Charles Ricardi, did when he was young. He lived near the base of the rope tow. Flora Jordan said her dad, Bradley Jordan, also helped the men. Skiers grabbed the rope at the foot of the hill and were pulled to the top where they skied over and down the hill. The Twin Mountain Outing Club ran it. They would ski down to where the first cabin at the motel now stands. Boston and Maine “snow trains” from Boston came into Fabyans Station in Bretton Woods where skiers were transferred by trucks to the ski tow. Some skiers were also brought to Crawfords where they hiked up and then skied down Mt. Willard. Flora’s father would charge $1 to transport them there. Twin Mountain High School seniors (5 or 6 total) sold coffee, hot dogs, etc. They raised money for the class trip in April. I don’t remember a skating rink but we did skate near the present day Zermatt Inn. At that time it was an inn owned by Dana Brown and we called the pond Dana Brown Pond. Eddie graduated in 1938 and the rope tow was running then. I graduated in 1944 and don’t remember it operating then. 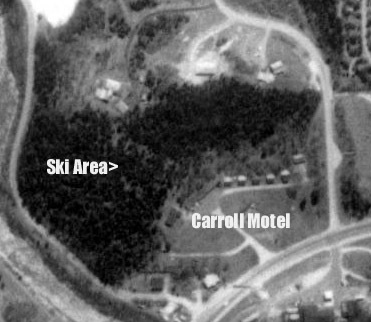 An overhead view of the area from 1994 shows the long abandoned and grown in former ski area near the Carroll Motel. When I was a kid, maybe 10 or 12 years old, I remember skating with my sister and other kids down at the skating rink in the open space between the Carroll Inn and the cabins. It wasn't a real skating rink but just a flooded area of flat ground where someone created a big patch of ice. As I remember the ski tow it was a home made rope tow driven by the remains of a car or truck motor. I skied there a lot, and at the time, I saw it as a really big hill. The tow went up the left side (east) of the hill with a wide open slope to it's right. Just to the east of the tow was a trail cut through the trees which was difficult for us kids. When I look at it today I can't believe it was as I remember it. The toboggan chute was on the west side of the slope. You could travel down from the top of the hill and continue across Carroll Inns Yard almost to the road, Rt #3.. It was a wooden structure with a level deck on the top for loading the toboggan and riders. Then they would tilt the deck and off you would go down the chute. I doubt that any of it remains there today but I'd like to check it out. In the summer. some of us kids would use cardboard to side down the chute which resulted in more than a few injuries from slivers and nails sticking out. I have no idea who ran the place or how it was operated. I do remember a few weekends when many townsfolk were there with their skis. It must have been fun because I have vivid memories of enjoying the slope. When the tow was not operating we had to climb the hill to get a ride.